It's only Monday and I'm already thinking of the weekend. You too? 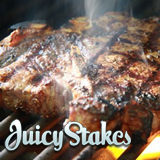 Fortunately Juicy Stakes Poker has added three midweek freeroll poker tournaments to help us through the week. Then on Sunday one of us could the weekly Series 2014 Final and pick up $1500 to blow at the WSOP! Then on Sunday there’s another Series 2014 Final that will award the winner with $1500 to take to the WSOP.